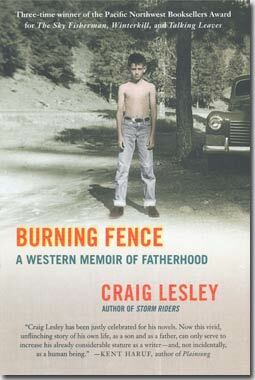 Published by St. Martin's Press in 2005, Burning Fence deftly captures the rural humor, rugged characters, and hardscrabble life of Eastern Oregon with its searing reflection on fatherhood and remarkable insight into the landscape of the Western heart. In this memoir, Lesley turns his keen eye toward two difficult fathers, his alcohol-damaged Native American foster child, and the panorama of 20th century Western America. Seldom has literature painted such vivid pictures of rural northwest communities and their people. With place names like Madras, Baker City, Pendleton and Portland, this book stretches from the high desert of Oregon to Washington and Idaho. It is peopled with real-life characters that extend beyond fiction, from Craig's shell-shocked father, who abandoned his family to become a reclusive coyote trapper and poacher, and the stepfather, Vern, a tough, controlling railroader, to Craig's colorful half-brother, a would-be hit man, now "born again."